With the Club Nintendo Year Rewards Program ending in a few days, I'm sure we're all wondering what sort of cool rewards will be doled out for the Gold and Platinum Elite status tiers (sorry, UK/EU friends but don't forget, we're all jealous of Japan). It's the Year of Luigi and thus we can all hope that the better brother with the better fashion sense will get his time to shine. Perhaps there will be something uniquely Luigi for us to fawn over come the end of the year. Or maybe, Nintendo will make us all cry when they stick Mario in there some how to steal Luigi's thunder. I certainly was expecting something The Legend of Zelda related in 2011 when it was LoZ's time to shine for celebrating its 25th Anniversary. Alas...it was not meant to be. Welcome to Flashback Friday Funtimes! The 2011 Elite Rewards Mario pins were actually very nicely packaged and quirky. I love my pins, don't get me wrong. Yes, yes... I also know that there were year long (and even now still!) celebrations for The Legend of Zelda with the concert series, the release of Ocarina of Time for the 3DS and of course, that snazzy LoZ themed 3DS system. But you know, I really wanted a Triforce to put into my room that year, or maybe a ridiculous talking hat to match my ridiculous nature. Something. Apparently, I'm all about asking for blood. Flashback Friday Fun Times: ...It&apos;s Dangerous to go without an Ocarina! 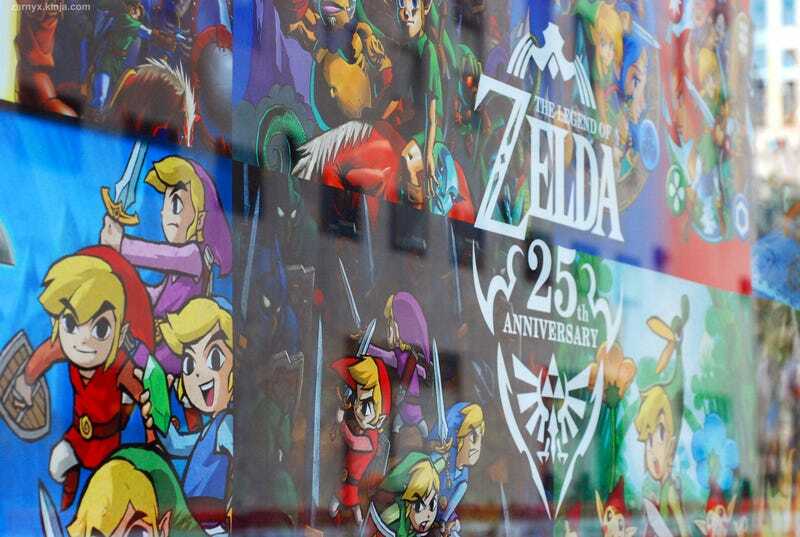 Still, I was fortunate enough to visit Nintendo World on Halloween in 2011 to bask in the warm glow of the gorgeous displays that were set up celebrating 25 years. It was a nice, quiet and reflective trip for me. I recalled my time chopping bushes and messing around Hyrule in the original game but never getting really involved to say I actually played the game. I actually did not play my first Zelda game until a few years after Ocarina of Time was released for the N64. Since then, I've played most of the games that followed with Majora's Mask being my favourite installment of the series and perhaps my favourite game of all time. I've journeyed with Link through forests, temples and dungeons. Together we helped a lot of people along the way, with not much gratitude in return. We bottled many a fairy, communicated with the Minish, become quite wealthy by obtaining rupees any which way possible, traveled by train and sailed the oceans blue. He and I fought dragons, wind gods, re-dead, countless other manners of beasts and occasionally fought our Darker Selves. We learned to play the ocarina, jammed on guitar, conducted symphonies of the wind, and learned how to play the harp. The Tribute at Nintendo World comprised many fun trinkets, pieces of history from the series and some beautiful figures I wish I could own. Heh heh, I want all of these crazy pins. A little fire to this, maybe and I wonder what will happen..
And I wonder what these taste like. There are a lot more pictures I took but trust me when I say that the collection was extensive and amazing. There were so many little things scattered about and I spent maybe a good hour browsing through it all. It truly was a good Year to be a fan of The Legend of Zelda even if Club Nintendo dropped Din's pearl and missed an opportunity. As for the Year of Luigi, thus far Nintendo World had a Launch Party for Luigi's Mansion: Dark Moon and Nintendo's pushing a lot out there in celebration of the awesome man himself. I'll be on the look out for events as they may happen at Nintendo World to be sure but in the meanwhile, here's hoping for a Luigi Reward this year. Let us not repeat 2011, Club Nintendo. Why, yes. I'll have more blood, thank you. Visit TAY Classic for 25 years' worth of awesome discussions. What? It's only been a few months since we started writing about life, video games and anything else we wanted to talk about on TAY and TAY Classic? You mean, we've only been tagging our posts with relevant tags and making sure to include one that says "TAY Classic" to be seen by all, for three months now?! TUT wrote a guide on how TAY works just shy of one month ago?! You liiiiiieeeeeeeeee...!! !